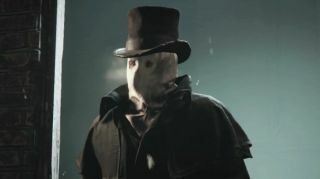 The Jack the Ripper DLC that was announced for Assassin's Creed Syndicate a few months ago now has a proper release date—December 22—and a story trailer that shines an entirely new light on what we've got to look forward to. The DLC takes place 20 years after the events of Syndicate, as we already knew, but it now appears that Jacob is out of the picture, and it's up to Evie alone to "deliver the Ripper's head on a spike." But it won't be as easy as all that: The Ripper is a man of many talents. More interestingly, it seems that Evie and Jack have a pre-existing relationship of some sort—there's a familiarity, at the very least—and they're clearly headed toward some sort of narrative denouement, as Jack alludes to when he asks, "How many more must die before you see the truth?" It is perhaps a bit too obvious, even for a videogame, but Jacob's absence, coupled with Jack's reference to a reunion and his very Assassin-like moves, lead me to wonder if—shocking twist!—Jack is in fact Jacob. Jack is, after all, one possible abbreviation of Jacob. Update: The post originally listed the DLC as coming on December 15, which is actually the release date for consoles. It won't be out for the PC until December 22.